Lovely little Olivia turned two years old and her family and friends were very excited to plan her a spectacular mermaid party! 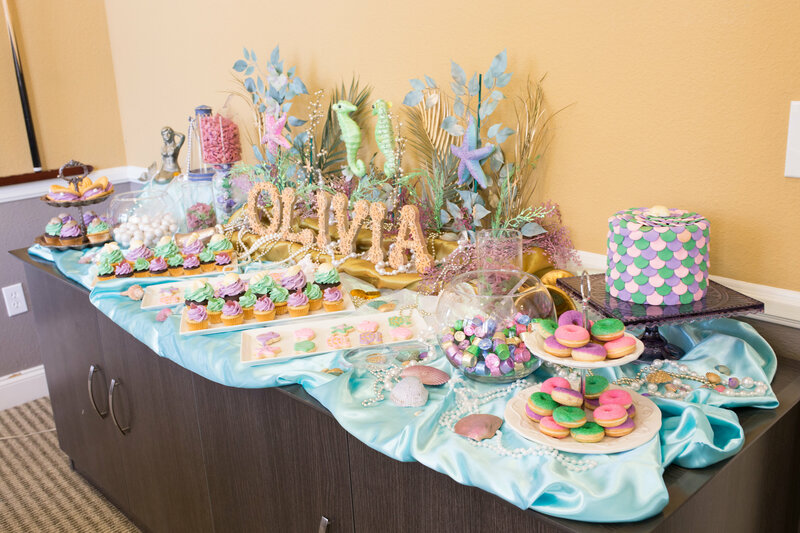 Olivia loves sea life, mermaids and crabs, so we created this one-of-a-kind Under the Sea party for her. We’re bubbling with excitement to share all the details with you, as well as instructions for the decor and treats! The dessert table featured a stunning array of mermaid themed sweets and treats, like clam shell madeline cookies, fluffy frosted cupcakes in shades of lilac and mint green, giant “pearl” gumballs, yogurt covered pretzels in the mermaid party theme colors, and gorgeous sea glass candy, with a soft, frosted finish. You can bet the little guppies at this party were swimming by to check out all the delectable offerings! It’s easier than you think to create a soiree just like this one! See all the festive details here ! 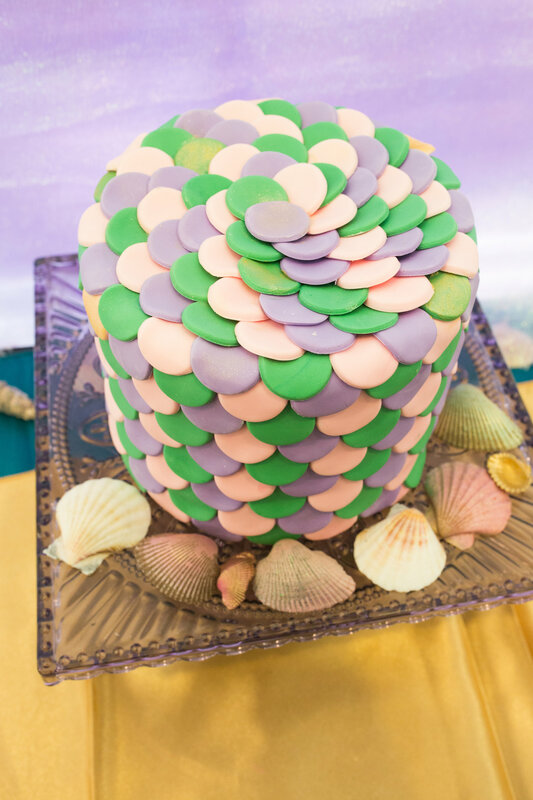 The birthday cake was decorated with shimmering fondant circles, to resemble real mermaid scales. Perfect for a mermaid party, and so easy to create! Click here for the scoop on all the oceany accents and salt-water-inspired sweet eats for this swimmingly splendid shindig! 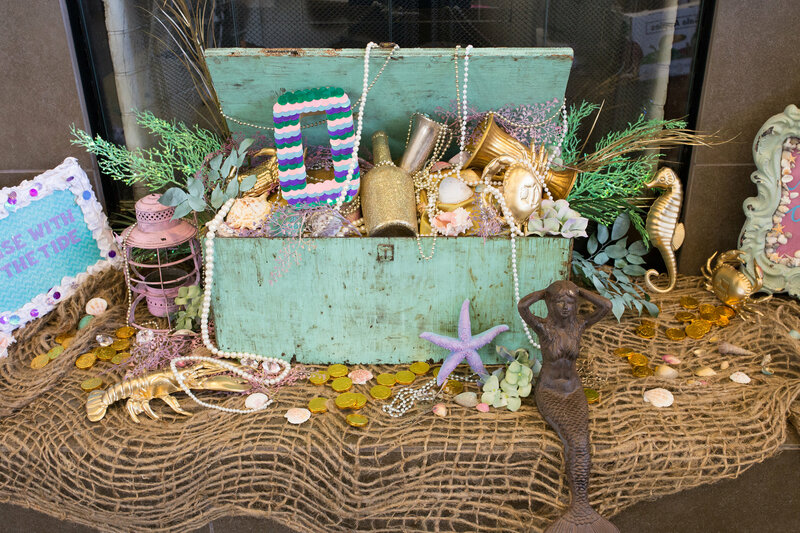 This mermaid party has it all, even a buried treasure chest, brimming with treasures from under the sea, like sea shells, beads and pearls and real chocolate coins! Hand crafted signs add to the mermaid party theme, while adding color and interest to the overall look. Of course, for any mermaid party, some fin-tastic favors, a tasty Mermaid Munch snack and a special mermaid guest are a must! Click on over to see this full and fabulous party in all its bubbling splendor, have you guessed who our special mermaid party surprise guest was yet? Styling, concept and decor: Ritzy Parties, Inc.